Sarah Catherine "Sadie" (Minerd) Luckey was born in 1867 at Hexebarger, near Kingwood, Somerset County, PA, the daughter of Charles and Adaline (Minerd) Harbaugh. She was the youngest of 62 grandchildren, and 40 years younger than her eldest cousin. As an infant, Sadie and her parents moved to a farm at nearby Nicolay, near Mill Run, Fayette County, PA.
At the age of 26, on Nov. 30, 1893, at her parents' home, Sadie married 35-year-old Joseph M. Luckey (1858-1955). Joseph was the first known cousin to graduate from what is now California University of Pennsylvania. In 1889, at the age of 31, he ran for commissioner of Lower Tyrone Township, Fayette County, and in 1893 campaigned for county superintendent, though he did not win. While teaching at Maple Summit, Joe boarded with postmaster Oliver F.M. Nicolay, who in turn introduced Joe to his future wife. 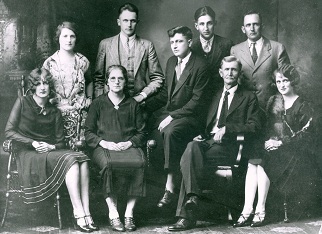 Their nine children were Dr. Paul David Luckey Sr., George Lawson Luckey, Charles S. Luckey, Mary Adeline Malone, twins Ray Luckey and Roy Luckey, Martha Rebecca Bailey, Andrew L. Luckey and Ruth Elizabeth Evans. Sadness enveloped the family when the twin sons, born on April 25, 1902, died in infancy. The Luckeys resided near Dawson, Fayette County. The town sat next to the Youghiogheny River, with the communities of Vanderbilt and Dickerson Run just across the river. Their first home was in a two-story log cabin on a rented farm next to the famed Linden Hall, an estate owned by coal and coke magnate Philip Cochran and his wife Sarah. After Philip died in 1899, and their only son passed in 1901, Mrs. Cochran became a very wealthy, powerful and compassionate philanthropist. At some point she asked our Joe if he wanted to buy the farm on which they were living. He said he could not afford it. She countered by asking how much he could pay. He said he could manage a price of $1,000, and she accepted the offer. Joe and Sadie remained on this farm the rest of their lives. When the Luckeys' eldest son Paul desired to pursue a medical school education, Mrs. Cochran offered to underwrite his tuition. Paul gave it serious consideration, but ultimately respectfully declined, as he calculated that his and his wife Olive's income would be sufficient. They were longtime members of the Bryan Methodist Church at Dawson, where they are buried. Sadie's letter to Roy S.
Sadie had a deep love for family which extended throughout her entire life, as demonstrated by many stories told by many cousins, and in letters she exchanged with relatives. You ought to see the little lambs now. They are awful nice and we have about fourty five little chickens and the calves are growing nice. I don't know when I will get down to your place but I think I will before long in a couple of weeks I think. Tell your Papa that Uncle Jake Minerd is poorly. I was there over last Sunday. They don't think he can live long. They Dr. says he will have to have his foot taken off and he thinks he can't stand the operation. He says he will die first. We are having plenty of snow this winter. There is good sleighing now and still snowing. If you was here you & Ernest cold have fine times coasting on the hill side. Pa made Ernest a nice sled. He is out with it near all the time.... We don't have any little lambs or calves yet the ones we had when you was here is big now but we still have milk but we don't get much any more. Tell your Papa that we are going to get a church house at last. They are going to begin next Monday. I was glad to hear that you are all coming up in the Spring. Now don't fail to come for we would be glad to see you.... Give my love to Papa, Mama, Jennie, Albert & Bessie not forgetting your self. Family portrait, circa 1920s. Front row, l-r: Ruth Evans, Sadie, Joe, Martha Bailey. Back: Mary Malone, George, Paul, Andrew and Charles. The Luckeys' home seemed to be a popular gathering place for the extended family. Sometime in 1910, Roy Minerd spent a week at the farm. He had such a good time that he returned with a good friend, Russell Hill. In 1925, Roy and his wife and young son stopped in again, unexpectedly, for a visit. Roy's widowed mother Margaret Jane (Sheppard) Minerd came to the farm once during the height of tomato-growing season. She picked a fat red tomato, took it back into the farmhouse, cut it into pieces, and sprinkled on sugar. The Luckeys were surprised since they usually used salt on their tomatoes. They tried some sugar, but did not like the taste. Sadie was known as a good cook, and made a cottage recipe known as smearcase (schmierkäse), a Pennsylvania-German type of spreadable cottage cheese. Once, Sadie's cousin William "Lincoln" Miner arrived unannounced, Sadie did not appreciate the sudden intrusion, but rather than "jangle" (argue), she was a gracious hostess all the same and served him a meal. 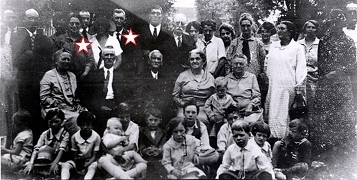 In 1913, 1920 and 1923-1925, 1929-1932, the Luckeys and their children attended Minerd-Miner Reunions at Confluence and Ohiopyle, PA. It would have been relatively easy for them to hop on the train at Dawson and ride it to the reunion sites, either on the Baltimore and Ohio Railroad or the Western Maryland Railroad. At the reunion in August 1923, at Confluence Park, Joseph was elected to the "committee on reunion" along with Daniel Martin Younkin, while Lawson Minerd was named president and Joseph Ream, secretary. The Meyersdale Republican newspaper reported: "A lot of routine business in relation to badges and other details was transacted. J.R. Minerd of Connellsville, made a fine address. The meeting was closed with singing, 'God be with us till We Meet Again'." In August 1924, the Luckeys attended the Minerd-Miner reunion at Lincoln's grove, near the Western Maryland Railroad Station in Confluence. Among the 82 individuals present were Sadie and her son George and daughters Martha and Mary, as well as Sadie's sisters Martha Gorsuch and Allie Overholt and brother Lawson Minerd. At the 1925 reunion, with 120 present at Sellers' hall, Joseph was again elected to the executive committee along with Freed Minerd, Ross Hyatt, L.L. Mountain and Daniel Martin Younkin, with Sadie's brother Lawson Minerd re-elected president of the association, and Joseph Ream elected as secretary-treasurer. Reported the Meyersdale Republican, "Rev. Joyce gave an address portraying the benefits of family reunions and showing why they should be held. Burgess C.R. McMillan gave a recitation and Rev. Williams of Connellsville made an interesting address." After the 1932 reunion, held at Lake Forest Park near Scottdale, Westmoreland County, Joe and Sadie returned home with visiting relatives to spend the rest of the weekend. Writing in the Huntingdon (PA) Daily News, their niece Laura Jane (Minerd) Williams said that "The party spent Saturday at the park, and then accompanied [the Luckeys] to their fine farm home and had an enjoyable visit with them until Monday." The Luckeys also enjoyed the annual Harbaugh Reunions, which began in 1926. They are known to have attended every year from 1948 to 1953, when Joe occasionally received the award as "Oldest Man Present" and they together won the award for "Longest Married." I received your letter. Was at the supper table when it came. I could not eat till I read it. I don't think I ever got a letter that I was more pleased and your visit if it was short. I think of so many questions I would like to ask you. One is where your Dad & Mother are burried and Uncle Eli. I have forgotten, and if you have Bess and Jennie's address please send it to me. I will try and let them know I am living. There is not many of the Minerd family left.... Andrew and Grace has friends in Erie. They were there last year. He tried to find you, looked in all the Directorys but could not find your name. They may go again some time. Will know where to find you now. Joe spent his entire career as an educator. His income for seven months of teaching in country schools was about $65 a month. In contrast, during a visit in Dawson, they learned that Sadie's cousin Rev. Isaac Herschel Minerd earned more as a janitor at a school in Pittsburgh. Joe supplemented his income by selling his vegetable produce, including strawberries, raspberries and cucumbers, charging a dollar per hundred pickles. Mary drove, using her newly purchased automobile. They stayed a few days in the aging farmhouse of Sadie's brother, Lawson Minerd, which he still used for farming and hunting purposes, even though his permanent home was in nearby Mill Run. Mary remembered that it was small and crudely built, with two rooms downstairs and two upstairs. Sadie and Mary scrubbed out the old spring house. Sadie and her sisters went to look for their childhood home, but the ground was all overgrown, and it was nowhere to be found., but the ground was overgrown, and it was nowhere to be found. They also motored in Mary's car to Hexebarger near Kingwood, Somerset County, PA, to spend a night at the farm home of their double-cousin, Rosetta (Harbaugh) Miner, widow of Civil War veteran Ephraim Miner. Heartache shook their world in April 1954 when their eldest son, the popular Connellsville physician Dr. Paul David Luckey Sr., died of blocked arteries at the age of 59. Both Sadie and Joe passed away in 1955. He died first, in February 1955. Sadie survived him only by four months, and died in June 1955. They are buried at Bryan Methodist Church at Dawson, among distant cousins of the McKnight family. At least 11 of the Luckey descendants have worked in the field of public education over the decades, and have been honored at our 1996 national family reunion, as well as on our special webpage, A Sense of Wonder. 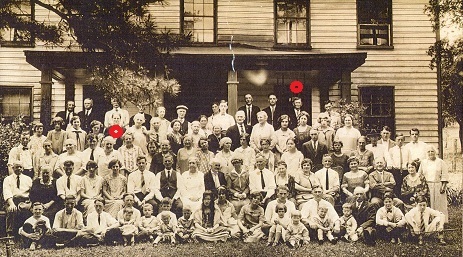 Sadie and Joe (red dots) at a Luckey Reunion, date and place unknown.